I love the idea of a destination wedding, especially if that wedding happens to take place on a cruise ship! Imagine how fun that would be – not only would your guests get to be part of your magnificent wedding but they would also get to go on vacation. And if you’re having a nautical wedding at sea, you’ll want to give your guests something fun as a favor. (Other than inviting them on your wedding/honeymoon cruise, of course). 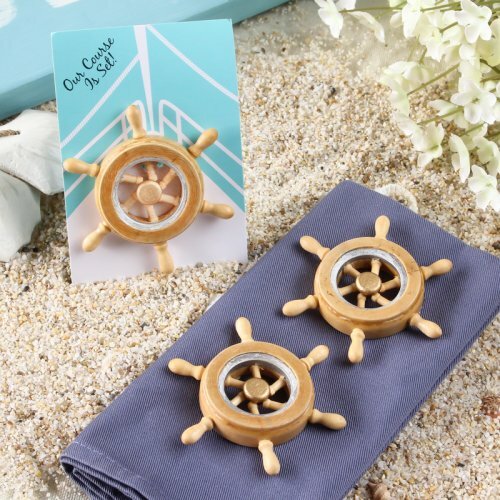 I think these “boat wheel” magnets would be the perfect wedding favor for your reception at sea. When your guests get home they can stick the magnets on their fridge and use them to hold up their favorite cruise photos. Every time they look at their pictures they’ll be reminded of your wedding and their fabulous vacation. You can find these boat wheel magnets here.